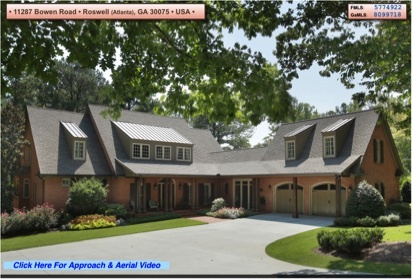 $2,785,000 - Roswell - Acreage Master-On-Main - 8 Bedrooms with a huge in-law suite. Approximately 8,500 SF of living space PLUS 3,600 SF of finished terrace level plus 497 SF of unfinished terrace level. Placed privately on 10 acres with pool and outdoor kitchen. 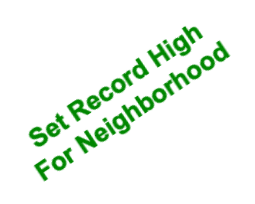 See all the detail at 30 page deep dedicated websites complete with aerial, driveway and fenceline videos. $1,700,000 - Roswell - StoneGate - Master-On-Main - 6 Bedrooms with a huge in-law suite. Approximately 9,500 SF of living space with indoor lap salt water, heated lap pool. Placed privately on gated 5 acres of lakefront with about 800 feet of shoreline. 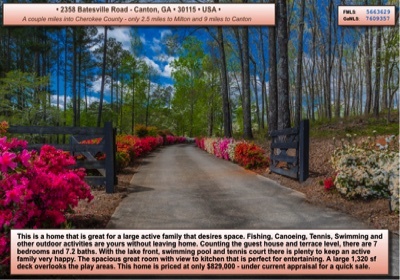 See all the detail at 30 page deep dedicated websites complete with aerial and driveway video. $549,000 - Roswell - Roswell's cliff homes in Historic Roswell remind us of Italy's Cinque Terre region with wonderful views of nature. This 3 level cliff home overlooking Vickery Creek and trail brings modern architecture to tree house atmosphere. Short walks to all that Roswell has to offer with 3 bedrooms and 3 baths. High end Sub-Zero refrigerator, Thermador cooktop and granite counters in kitchen. Much larger than it appears from the front view of home. $869,000 - Milton - Luxurious Richmond Glen subdivsion out the front door and 3.6 acres of country life out the back door complete with walking trails, gardens, muscadine vines (wine! ), campfires and large creek. $279,000 - Atlanta - Gorgeously renovated Craftsman home, perfectly situated in desirable West Midtown. Enjoy the exceptional quality of this open floor plan, sparkling kitchen and baths, hardwoods thru out, finished multipurpose basement with full bath, sunroom that provides extra living space/optional home office and master bedroom with his/her closets. Underwood Hills neighborhood is ideal for intown living: playgrounds, tennis and basketball courts, exceptional school district, walk to retail and restaurants, dog park and easy highway access. Minutes from Buckhead, Airport and Downtown. 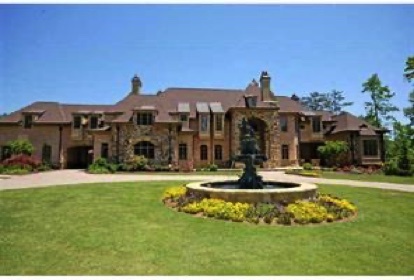 $3,500,000 - Roswell and Cobb County! - Wall Street Journal's "House of the Day" and reader voted "House of the Week" about 3 years ago. This home was built at a cost over $9,000,000 and is yours for about 1/3 the price. 5 Bedrooms plus an Inlaw Suite and a separate Guest House. 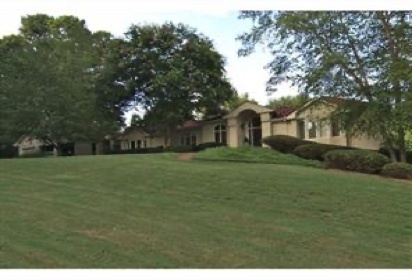 Located on 3.37 acres about 1,000 feet into Cobb County (lower taxes!) Features an indoor pool in a 2,000+ square foot room with electrically operated huge glass doors to let the outside in or keep the outside out in the wintertime. This room was featured on HGTV's "Million Dollar Rooms". A perfect home for the entertainer as it has a large ballroom suitable for a 200 person event and is even structurely built to showcase your automobile collection of about 10 cars in the airconditioned space. Indoor Pool as Featured In HGTV's "Million Dollar Rooms"
$4,250 Per Month - FULLY FURNISHED! Just bring your toothbrush. A Town Home, valued at $800,000, in Historic Brookhaven. Just a few minutes walk to MARTA, amazing shopping, office space and night life. Your own Private elevator to all floors. A Chefs kitchen with Sub-Zero refrigerator and Wolf range and lots of counter space. His and Hers closets in very large master bedroom. Enjoy an evening cocktail in your fenced courtyard with fountain. $750,000 - 7.5 Acre Lakeside Estate with featuring a 7 bedroom home with Master on Main, Tennis Court, Swimming Pool, Guest House, and about 7,400 sf of living space on the property. Plenty of room for private entertaining on this lake property. $539,900 - Much sought after Park Forest home. Home has just finished a major renovation with all new kitchen featuring new cabinets, new counters, new appliances and new lighting. 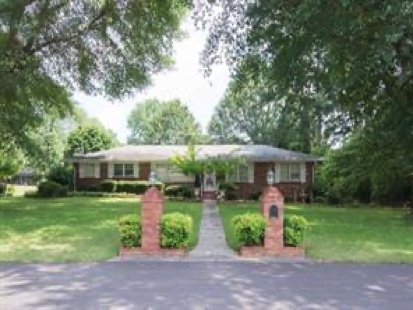 The home has new hardwoods, new carpet flooring, new windows, new paint inside and out. New Master Bath. Daylight basement has just been finished with bedroom and bath. Nearly every surface has been touched to make this a nearly new home for you. $395,900 - Ball Ground - Amazing pristine setting for this large ranch on a full basement. Rocking chair front porch and back deck / patio. 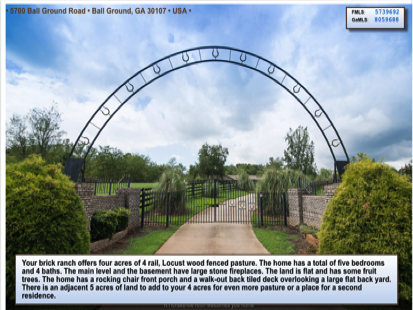 Four acres of land completely fenced for horses with long lasting 4 rail Locust fencing. 3 bedrooms with 3 baths plus finished basement with two additional bedrooms and one bath. Two amazing stone fireplaces. Ask your agent for the website with aerial and drive-around videos. Adjacent 5 acres available. 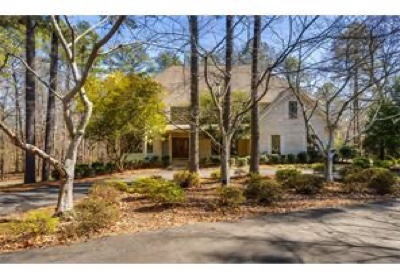 $1,450,000 - One of the nicer homes in the luxury center of Roswell. It features 3 acres, master-on-main, walk-out swimming pool and lots of entertainment space. The home has been totally renovated is is privately placed down a 750 foot entrance. With nearly 7,000 square feet, the appraiser praises this home as being the most luxury for the money. $549,000 - Think Italy's Cinque Terre homes. The Cliff House is placed on Roswell's rugged cliffs looking down on Big Creek* that feeds into the Chattahoochee River just down stream. 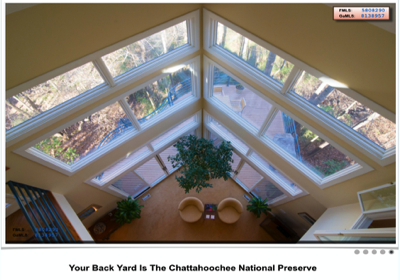 It is also overlooking the Chattahoochee National Preserve and it becomes the perfect home for nature lovers who appreciate a unique home with a relaxing "tree house" view from nearly every room. $699,000 - Home located in the heart of Roswell's luxury homes. Located just off Bowen Road, at the end of a Cul-de-Sac, this 5 bedroom / 4.1 Bath home is placed on 2.5 acres with the majority of the acreage in the very private and wooded back yard. It is absolutely "move-in" ready and a very quick closing can be arranged. You will be amazed by the huge custom built, by a fine craftsman, Brazilian Hardwood deck. 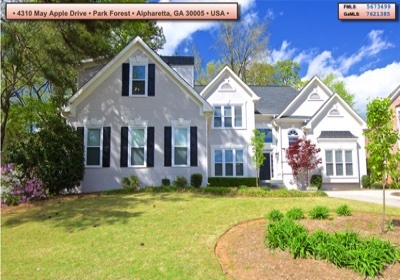 $399,900 - Alpharetta - WOW, the potential that is here with this lovely home on a corner lot, fenced back yard, attached 2 car garage plus a detached 2 car garage / shop / office. 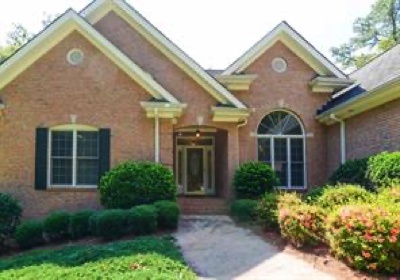 Walk to downtown Alpharetta, Walls Park or the elementary school. A wonderful "Mayberry" like neighborhood where everyone knows everyone. Catch the wave of this gentrifying area while the prices are still low. 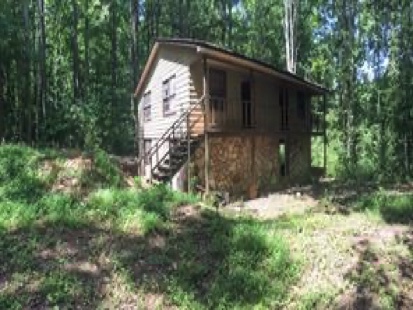 $165,000 - Ball Ground - This is a nicely secluded five-acre parcel that has a structure on it that has been gutted and all ready for a renovation. Living space, per tax record, sitting on top of a full basement level of the same size. It has water, electricity and a septic tank already in place. The structure is studded out and ready for full renovation. An easy project for someone with decent handyman skills. Seller will consider owner financing until renovation and permanent financing can be obtained. $2,400,000 - Timeless elegance in prestigious Roswell. 9 Bedrooms, 11 bath European Manor on 2 acres! Four Levels, Spectacular ceilings that make statements in most every room. The virtual tour only serves to remind you of some of the many, many features of this home that can only be appreciated by seeing this home in person. The terrace level will be where you and your guests spend most of your good times. A gym, pool room, game room, a bar, TVs everywhere & a 10 seat theater. Outside in the very private back yard find the cool comfort of the pool. This is how you deserve to live! $449,500 - Amazing 4-side brick RANCH on full unfinished basement. Wheelchair accessible 36" doorways and ramp from garage. Privately placed on Cul-de-Sac. Open floorplan and great Master. Lots of walk-in closets!!! Home built in 2000 by builder for his Mother so you know it had to be perfect for her or she would have yanked a knot in his tail. Quick closing available. $849,000 - Roswell - Come and fall in love with the nicest home in the neighborhood! Master-On-Main - 4 Side Brick - Open Floor Plan- 3 Car Garage - Plantation Shutters throughout and both Deck adn Patio are Tiled. Sit on your very private patio and have a glass of wine from your Wine Cellar while listening to your soothing fountain. Award Winning Cobb County Schools and low taxes. Over $123,000 in owner upgrades since purchase. $1,199,000 - Waterfront living in Roswell! 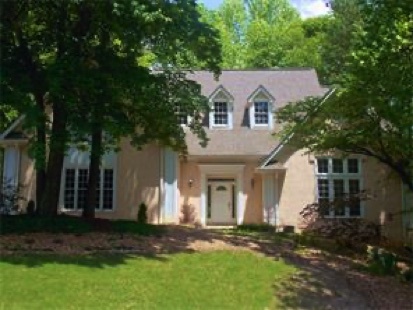 A gorgeous home and property nestled on over 3 private, wooded acres. Enter the gated cul-de-sac and down the beautifully lit driveway to your new peace of heaven. This home features master on the main with a sitting room, fireplace and balcony overlooking peacefully private lake, open floor plan, beautiful moldings, in law/office suite, invisible fence, hardwood floors, newer roof/gutters and a Lake View! $1,000,000 - BEAUTIFUL CALIFORNIA RANCH - 6 bedrooms, 6 baths. 3 garages. Walk out gunite heated Salt Water Pebbletech pool. On cul-de-sac. 3 fireplaces, flooring is Italian Travertine. Updated kitchen. Current DS Murphy appraisal for $1,000,000! Back gate opens to McFarlane Nature Park - an 11 acre jogging and dog walking park. Check the virtual tour to see dedicated multipage website for this wonderful property. Some TLC needed but HUGE upside potential! 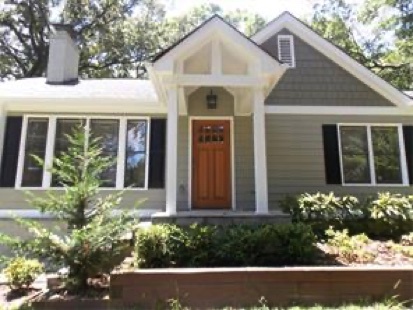 A very quick closing and occupancy as the owner can close and vacate as quick as you desire to close. Yes, I will sell all price ranges. While my focus is on "Luxury Properties" (defined as top 10% of all sales in the area), I am frequently asked by my friends, family and luxury Clients to sell an investment property or family member home for them. I am always pleased to do so and these homes will always get my unique dedicated websites to ensure my success for my Clients. $460,000 - Gorgeous Open floor plan! Located on a quiet cul-de-sac in sought after Spalding Lake subdivision with easy access to 400 and I-85. 2 story ceilings welcome you. The house boasts incredible kitchen renovation with custom copper hood, tranquil sunroom, updated bathrooms, tons of closet space, tankless water heater and upstairs laundry room. Retreak to oversized master bedroom with 3 closets and gorgeous bath with radiant tile floors. Certified hard-coat stucco. $1,400,000 - Ranch on the 17th green of Atlanta National Golf Club. Unique Masterpiece on full finished terrace level built to same quality and ceiling heights found on main level. Circular drive, 4- car garage and wrap-around rear & side paver deck. Hurd casement windows throughout. 100-year-old 300 pound castle front doors that were reclaimed from old Atlanta bank. Crown moldings have 4-8 pieces. Cherry cabinets with hand made corbels. Wine cellar with tasting room. 10 unique ceilings including barrel ceiling in dining room. 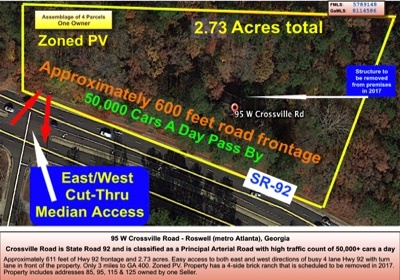 $899,000 - 2.73 acres of commercial property - zoned PV - and has approximately 611 feet of road frontage on Hwy 92 - W Crossville Road - just west of Crabapple Road. Traffic Count is over 50,000 cars per weekday right in front of this property. A huge asset is the turn access through the median so that there is direct accces to east / west traffic to the property.